Hal Kalman is currently writing about several architect-teachers who were committed to heritage conservation and architectural history, as well as to restoration practice. 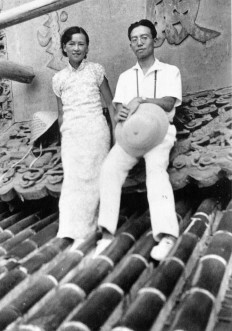 One project treats the careers of Liang Sicheng (1901-72) and Lin Huiyin (1904-55) (illustrated), a husband-wife team who were educated in the U.S., returned to China, and sought to develop a modern Chinese architecture that remained respectful of traditional principles. Along the way they transformed the state of architectural history, conservation, education, and design in their country. A second study looks at their contemporary – and in many ways their parallel – Eric Arthur (1898-1982). He was born in New Zealand, educated in England, and spent his professional life at the University of Toronto as an influential teacher, writer, architect, preservation advocate, and architectural historian. The three will also become the subjects of books. A recent article by Hal, published in the Journal of the Society for the Study of Architecture in Canada (40:2, 2015), tells the story of Martin Eli Weil (1940-2009), a former colleague and friend, who worked as a restoration architect for the Government of Canada in the 1970s, during which time he founded the Society for the Study of Architecture in Canada. He spent the last three decades of his life as an exemplary restoration architect in Los Angeles.